Conch Republic Fishing is committed to promoting fishing tourism and quality fishin services to those who plan to travel to The Florida Keys and Key West by creating high definition fishing and travel related info videos that steam live on the internet. In entertaining short video info episodes, Conch Republic Fishing shows both the seasoned fishing tourist as well as families and children the newest and widest selection of fishing and travel destinations that The Florida Keys Key and West have to offer, always free and on demand. Whether you are looking for cheap Florida Keys Hotels or luxury island resorts and spas, Conch Republic Fishing has reviews and fishing videos as well as direct contact information for all. Begin your travel plans search by watching the five Chamber of Commerce videos and then on to the hundreds of other informative venues. Our expert Florida Keys and Key West fishing and travel info hosts take you behind the scenes for a look into The Conch Republic lifestyle and the diverse people who define it in the heart of the American Caribbean. 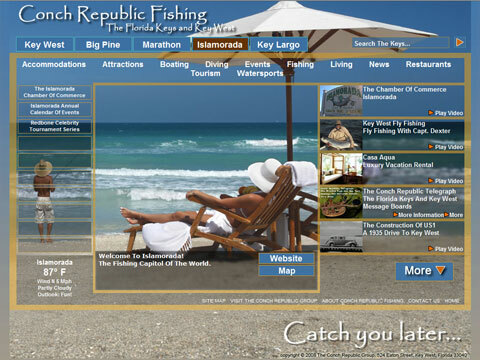 Don't forget to log in to www.ConchRepublicFishing.com every day and stay up-to-date on our most recent video info segments, video info news programs and regional travel information. All fishing information for video programming is thoroughly scouted to ensure that Conch Republic Fishing brings you only the finest Florida Keys and Key West videos about destinations, products, services and trends. The Conch Republic Group andConch Republic Fishing covers topics about the Florida Keys and Key West by providing fishing info about accommodations, arts, attractions, boating, weddings, dining, diving, bars, entertainment, events, families and children, fishing, iving, news, realtors, shopping, tourism, weather and watersports. And while your at it, join in and chat with "in the know" locals on the Conch Republic Telegraph Find out where to go, what to do and see, plus get inside track info! Make new friends from The Florida Keys and Keys West. It's free! The weather here is great all year round so "anytime" is a great time to visit. "The Florida Keys and Key West. We're flip flop friendly"!